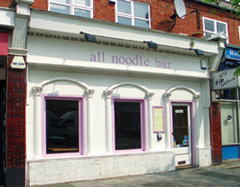 Here at the All Noodle Bar you can enjoy a delicious bowl of noodles as well as a fun karaoke evening. We have over 45 discs of songs to choose from, so why not book your birthday party here, stag or hen nights, office parties, any parties! Come in and see. Select from 25 different types of oriental noodles - from Udon to Ramen. All the tastes of Asia in one stop in a fun, bright and relaxed atmosphere. Excellent food I have been going there for 4 years now, 3 times a year just love it.